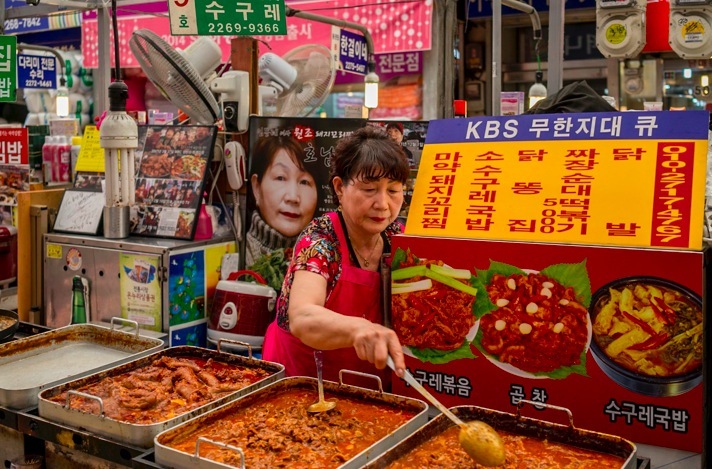 My final post about this fascinating market in the heart of Seoul (after writing about the textiles and fresh produce sold there) has to be about the food, specifically the street food the market is FAMOUS for. That’s the main reason for going to this place. There is a big cross section with lots of little food stalls. A glass roof has been added in recent years, so you an sit at the stalls despite rain or snow (we had neither, it was a beautifully sunny day!). The food stalls serve food all day – and it is an amazing sight, with lots of interesting smells! 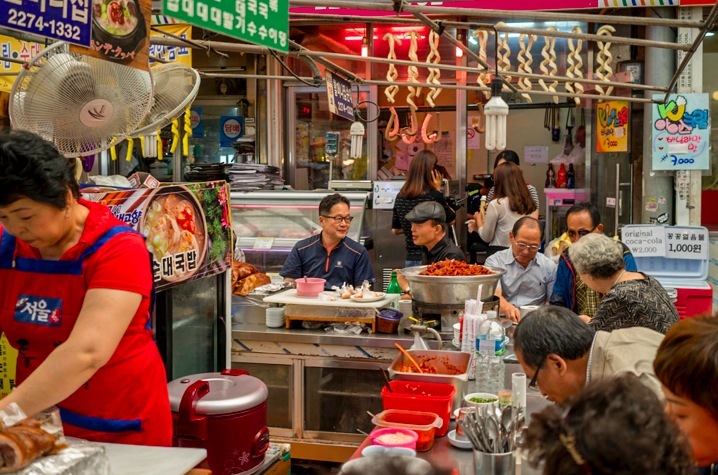 Koreans flock to the market all year round to sit at the benches lining each of the booths and sample the foods – so we were one of the few tourists there. Everyone was smiling and laughing at us, waving us over to try their food. 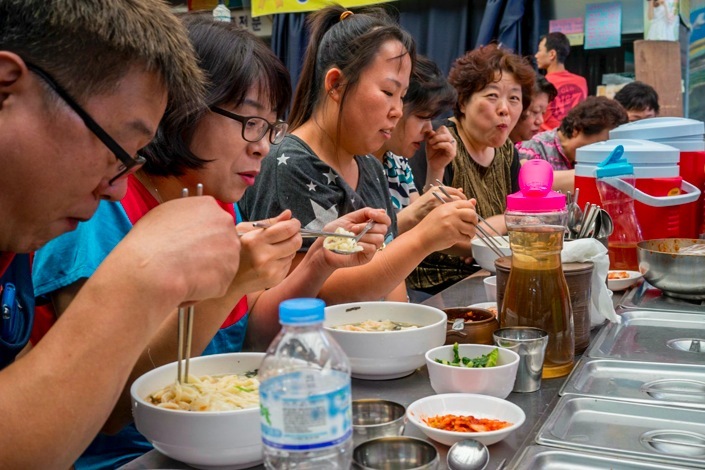 Among the featured delicacies, visitors can find bindaetteok, mayak kimbap, soondae, pigs’ feet, bibimbap and various others as well, all offered alongside bottles of makgeolli or soju. Bindaetteok is a type of flat cake made of mung beans. 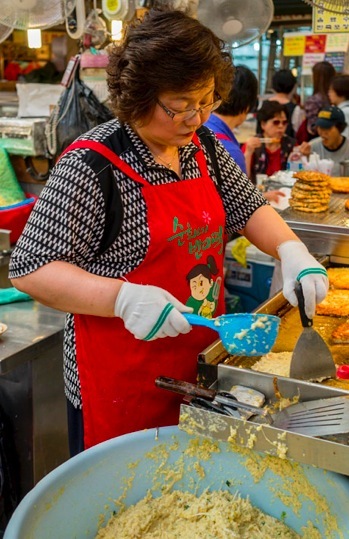 The mung beans are ground up in constantly revolving stone pestles, churning out a thick paste which is then mixed with bean sprouts, green onions, and garlic and poured into a fryer. What comes out is a thick, crispy disc with the texture of hash browns or a Swiss-style Roesti, but the taste is certainly different. The first recorded mention of bindaetteok comes from the Eumshik dimibang, a Korean cookbook written around 1670. It was originally a food for commoners who couldn’t afford meat. It is also known by the name nokdujeon. 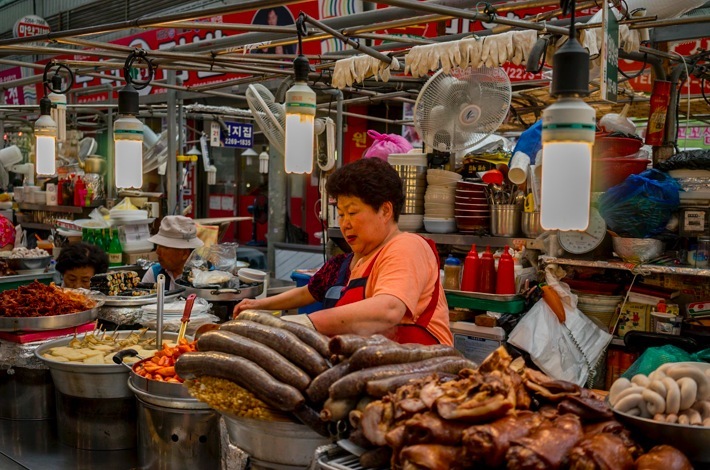 One of the other main signature dishes of Gwangjang Market is soondae, which is made from cow or pig intestines that have been stuffed with various ingredients, usually cellophane noodles, barley, and pork blood. 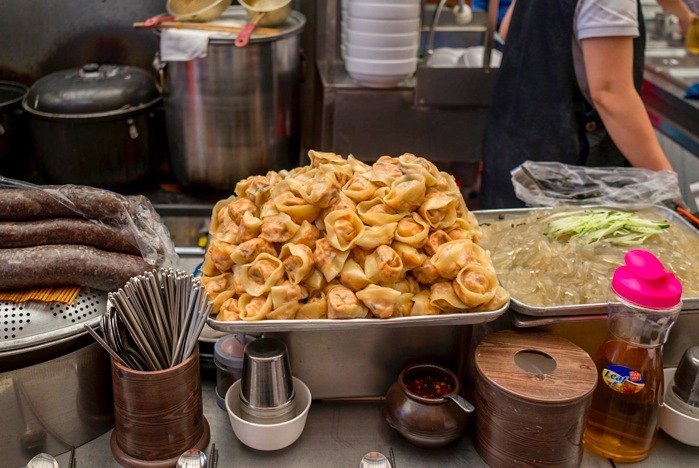 The history of this dish goes back to cookbooks written in the 19th century – and the pork/cow sausages were sold at several food stalls. 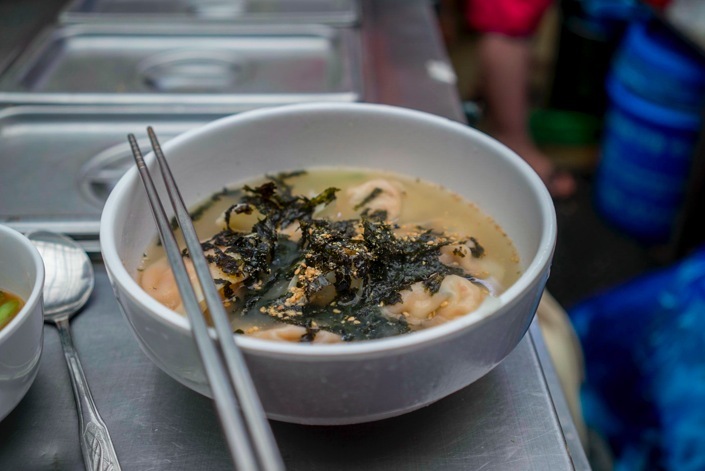 Another popular dish is dukboki, a Korean snack food made from soft rice cake, fish cake and sweet red chili sauce. It looks like a big stew with ketchup, but it tastes sooo much better – it is rich, sweet and hot! Typical ingredients are boiled rice cakes, Surimi, spring onion, soy-and-chili paste, onions, diced garlic, salt, sugar and different kinds of seasoning based on the taste. The interesting thing is that I first disliked rice cakes when I ate them at School food at Times Square in Hong Kong, but the ones I had in Korea, I really loved! Finally, we decided to eat at one food stall that was really crowded and had a pile of freshly, handmade dumplings (I think they are called Mandu) in front of them. The only thing we could gather is that they are really good (everyone was enjoying them) and that we should sit down and enjoy them in a hot broth. We did as we were told! I am not sure what they were filled with, vegetables for sure, but the other ingredients could have been fish and/or meat. It was tasty, that’s for sure! The food stands are open seven days a week, usually from 11 a.m. to 11 p.m. However, the clothing and fabric stores tend to close every Sunday. The market is most easily reachable from exits 7 and 8 of Jongno 5-ga Station. You can visit the official website for the market – but it is only available in Korean. 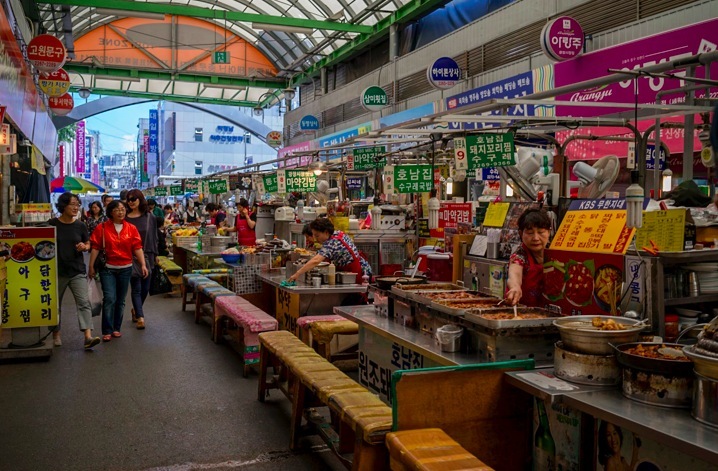 My favorite market in Seoul, precisely for the food. So good and cheap, and great atmosphere.